Are you suffering from consistent discomfort and in need of a Gastonia spine doctor? Call our office at The Spine Clinic at Neuroscience and Spine Center of the Carolinas today to learn what we can offer you in terms of elite-level, compassionate care. We’ll go the extra mile to help you achieve and maintain optimum health! At The Spine Clinic of Neuroscience and Spine Center of the Carolinas, our team of seasoned specialists is proud to offer top tier spinal care to our fellow members of the Gastonia community, extending out to the entire state. Our exceptional treatments are informed by our doctors’ many years of experience in providing comprehensive examinations, treatments for chronic back and neck pain, degenerative scoliosis, degenerative spondylolisthesis, lumbar spinal stenosis, ruptured intervertebral discs, spondylosis, spinal injuries and spinal tumors, lumbar degenerative disc disease, herniated discs, as well as issues involving the brain and nerves. With our high-level treatment and the advanced technology at our state-of-the-art facility, we’re able to offer patients highly effective and pain-free treatments that offer freedom from pain and an improved quality of life. We offer brain surgery, carpal tunnel surgery, non-surgical treatment, surgical minimally invasive procedures, stem cell injections, and spine surgery. We also understand the importance of making patients feel respected, welcome, and well-informed; that’s why our light-hearted office environment is carefully maintained to ensure that patients of all ages and walks of life can feel at-home from the moment they walk through our door. Are you suffering from pain and in need of a Gastonia spine doctor? Call our office today to ensure that your treatment is managed by a doctor whom you can trust! To speak with a caring Gastonia spine doctor about receiving treatment, reach out to our esteemed office at The Spine Clinic at Neuroscience and Spine Center of the Carolinas today! Sometimes when you perform a repetitive motion with your hand or arm you may develop carpal tunnel syndrome. There are several treatment options available, but when nonsurgical options do not help relieve the pain, you may need to have carpal tunnel surgery. At our practice, The Spine Clinic at Neuroscience and Spine Center of the Carolinas, our surgeon is able to provide you with Gastonia carpal tunnel surgery. Our expert doctor is Dr. William Hunter. He is a board-certified neurosurgeon with more than a decade of experience. He lectures across the country about minimally invasive surgical techniques. 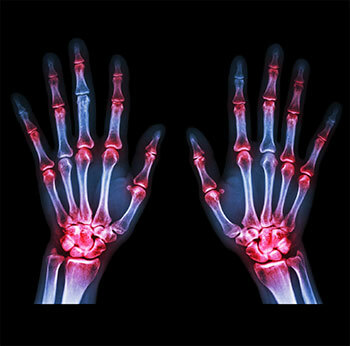 Many patients come to our practice when they need to see an expert spine doctor for relief of carpal tunnel problems. When a patient first develops carpal tunnel syndrome, they may be provided with ways that they can exercise the affected area. Massage therapy, splints, or injections may also help. In extreme cases, the patient will need to have Gastonia carpal tunnel surgery. At our surgical practice, patients are either able to get endoscopic surgery or open surgery for their carpal tunnel syndrome. Most patients who have problems with carpal tunnel syndrome do not need to have surgery. Surgery is only considered when symptoms have not improved after several weeks or even several months of nonsurgical treatment. If symptoms are so severe that they restrict your normal activities, there is also a need for surgery. These types of problems can present themselves as a persistent loss of feeling of coordination in the fingers, or decreased strength in the thumb. If your sleep is severely interrupted by pain, it may also be time to have carpal tunnel surgery. If nerve tests show that there is damage to the median nerve, surgery may also be indicated. There are two types of surgery that are generally used for providing relief for carpal tunnel syndrome. Open carpal tunnel surgery has a longer recovery and will leave a larger scar than endoscopic surgery; however, there may be less chance of other complications developing. Endoscopic carpal tunnel surgery will have a quicker recovery and will leave a smaller scar; however, there may be need for additional surgery later on. For an appointment to see our expert surgeon regarding getting Gastonia carpal tunnel surgery, simply contact our office for an appointment. e doctor that can provide you with the comprehensive spine care that you need. Spinal conditions, injuries and other issues are incredibly serious and should be treated with the utmost care. This is why it is so important that you find the right specialist. The spine is what binds your entire musculoskeletal system together, so any conditions that affect the spine will undoubtedly affect other parts of your body as well. Spinal conditions may be life threatening, such as those involved in injuries or accidents, or spinal issues where a tumor or other growth may be involved and impeding on your health.  Other issues, such as deformities and other disabilities can require treatment and constant care as well. 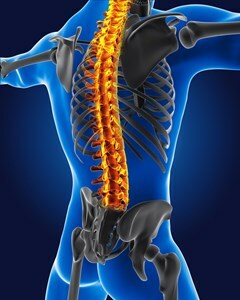 Here at The Spine Clinic at Neuroscience and Spine Center of the Carolinas we can help pair you with a Gastonia neurosurgeon that can help with any spinal care that you might require, whether it be for a particular issue or for the long term. Taking care of yourself and your health often means making sure that you are in the right hands when it comes to care and treatment. If you have any spinal conditions, diseases, problems, pain, deformities or other such concerns, you need to find a specialist that will be able to provide you with the custom care that you need in order to recover and live your life in peace. If you need a Gastonia neurosurgeon then please call us here at The Spine Clinic at Neuroscience and Spine Center of the Carolinas and we will begin to help you right away. A herniated disk results when one of the small, spongy disks between your spinal vertebrae becomes damaged. 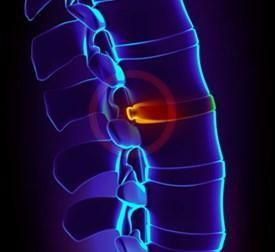 These disks act as cushions between the vertebrae, absorbing shock and keeping the spine flexible. The damaged disk may bulge or break open, compressing the nerves. Disk herniation is usually the result of a steady, age-related wear and tear called disk degeneration. As you grow older, some of the water content in your spinal disks are lost. That makes them not as supple and more predisposed to tearing or rupturing, even from some small tension or twist. Many people are unable to identify the exact reason for their herniated disk. Occasionally, using your back muscles instead of your leg and thigh muscles to lift big, hefty objects can cause a herniated disc. Twisting and turning while lifting a heavy object can also do the same thing. 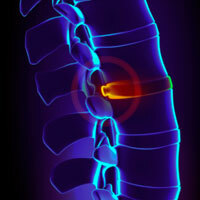 A herniated disk may be caused by the general wear and tear of aging or by a spinal injury.